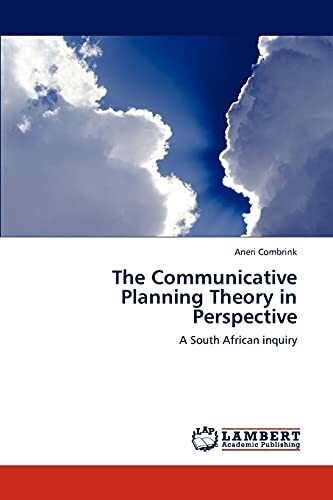 Communicative Planning Theory (CPT) seems to inaugurate questions within the South-African context, which could result in the creation of a healthy living environment in South-Africa, and in turn accommodate the growing question in the global North (USA and Europe) of how to best accommodate a heterogeneous public. Planning theory and practice is the bearer of norms and values formed at the origin of its development, arguably, Europe and the USA often referred to as the global North. The communities wherein planning is practiced (particularly South-Africa) are the bearers of their own norms and values (numerous groups and cultures are present in South Africa). The norms and values of the two identified spheres do not seem to ‘understand’ each other. Consensus is based on mutual understanding, which in turn is essential in a democratic society. Communicating groups seem to differ in their very system of being and perception of things, which goes beyond speech. Therefore one could ask the question of how then does one understand or identify the true need of the public (Watson, 2002). Aneri Combrink studied Town and Regional Planning at the North West University (NWU) Potchefstroom Campus, where she obtained her Master's degree in 2011. She is currently working at the University of Pretoria as a researcher. She lives in the grace of Jesus Christ.